Serie A returned for the first time in 2019 this past weekend, as AC Milan and Juventus didn’t disappoint their fans on Monday. The two Italian giants were in action last week in Jeddah where the Bianconeri prevailed in their Supercoppa clash, but league matters were on the agenda this past weekend. Gianluigi Donnarumma gets us underway between the posts after making a string of crucial saves in his side’s 2-0 win at Genoa, keeping them in the game in the first half. Kevin Malcuit impressed for Napoli as they secured an important win over Lazio, while Gianluca Mancini helped himself to his fifth Serie A goal of the season while also helping Atalanta keep a clean sheet against Frosinone. Daniele Rugani was also on the mark and kept things tight in Juve’s win over Chievo, while the Milan and Juventus theme continues in midfield. 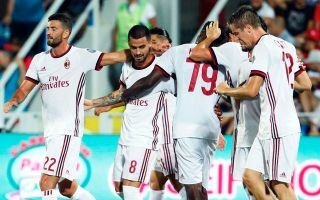 Suso’s late goal secured all three points for the Rossoneri as the Spaniard’s return from injury was a huge boost, but it was Tiemoue Bakayoko’s imperious display in the heart of the midfield that was a key factor in the win. The Chelsea loanee continues to impress as he offers a real physical presence to protect the backline, while also using his athleticism and agility well to make driving runs forward. In turn, it remains to be seen if Milan opt to make his move permanent this summer. Juve duo Emre Can and Douglas Costa complete the midfield, with both stars getting on the scoresheet as the former bagged his first goal for the Turin giants with a composed finish. Up front, Duvan Zapata can’t be ignored after his four-goal haul took him joint-top of the goalscoring charts in Serie A this season, while Luis Muriel and Fabio Quagliarella scored two apiece in a thrilling encounter between Fiorentina and Sampdoria which ended 3-3. With that in mind, that dangerous trident had to be included in the XI which in turn forces an unorthodox formation, but there was undoubtedly plenty of quality and stand-out performances left until Monday with both Milan and Juventus picking up wins. Serie A team of the week (3-4-3): Donnarumma; Malcuit, Mancini, Rugani; Suso; Emre Can, Bakayoko, Douglas Costa; Muriel; Quagliarella, Duvan Zapata.